Often, the more challenging parts of an interpreter’s job are duties aside from interpretation. That is certainly true for me. One area that can be both rewarding and frustrating, often both, and sometimes when working with the very same person, is using the help of a volunteer. Okay, it’s true for co-workers too. Any relationship is like that really (anyone with a spouse is likely picking up what I am putting down) but volunteer management is unique. My facility relies heavily on volunteers for a wide range of tasks. In many instances, we couldn’t do it without them. In some cases, we can do things more efficiently without them. Naturally, maximizing the former and minimizing the latter is key to success, but it is not always easy. I have found that looking at a volunteer as an interpretive audience of one can be quite helpful. What is that person’s motivation to show up and what preconceived notions does s/he have. Someone’s background tells a lot about two crucial traits of a volunteer- job experience and confidence. We get every combination from over-confident yet never done that kind of work before to a retired professional that feels uncertain of doing the job in a new setting, and everywhere in between. Considering where a person falls on the experience/confidence spectrum has been invaluable to me in figuring out how to help someone meet their personal and maybe professional goals while reaching my goals for whatever work they are doing. If you get it dialed in, you can provide an amazing experience for someone to connect with your resource in a way a casual visitor cannot have and buy yourself more time to get things done. Anyone have too little to do at work? When I started volunteering for NAI as Deputy Director for the Sunny Southeast I wasn’t quite sure what I was getting into. Before that I became a CIG, and attended a couple of Regional Workshops in Ohio and North Carolina. Somewhere along the way I realized that paying attention to the small details is what makes a good interpreter great and understanding the big picture makes you an outstanding one. Since then I have met some of my interpretive heroes, at Regional workshops listening to stories about the evolution of human tools, interpreting dandelions, making whistles with sticks, cleaning rivers, fairy houses, and hummingbirds. All amazing experiences that have helped to be who I am today. Take advantage of all the opportunities to learn from others and become better and what you do today and what you want to do tomorrow. Everything started with interpreters who worked with me and worked nearby. Attending Regional workshops is a fantastic environment to “show and tell” what other are doing. This year interpreters from the Sunny Southeast will be going to Puerto Rico to share experiences, skills, and the “inside scoop” of interpretation. Take advantage of this great opportunity and hopefully we will have a chance to catch up in the island. As a manager of a nature center, it is easy to get caught up in the daily interruptions, challenges, and projects that seem to come out of nowhere. Our plates are full between managing staff, volunteers, facilities, programs, animals, visitors, trails, kiosks…the list can goes on. It is so easy to push aside the less urgent but most important aspect of our jobs: effective leadership of our staff. Yet when we take the time to cultivate relationships and empower the people who provide programs for our patrons, we are truly investing in providing better services all around. These serve to help me learn about what is going on with them, what they are working on, where they are struggling, and what they hope to accomplish. It’s a great time for me to provide feedback and help them work through problems to find creative solutions. It is easy to become stagnant and not work towards a higher vision when we get busy. I challenge my staff to set both short-term and long-term goals for themselves over the course of the year. We focus on SMART goals: Specific, Measurable, Attainable, Relevant, and Time-bound. We discuss everything from general housekeeping, updates, program development, special event planning, marketing, etc. Getting the entire team together allows for the flow of ideas in a supportive environment. Everyone has a role during the meeting to ensure active participation. The best way to get refreshed and learn new ideas is by visiting another facility. We try to do this a couple times a year. Each experience has been rewarding for the staff. One of my staff members came up with the great idea of ‘Each-one, Teach-ones.’ This is where a staff member can spend 15-30 minutes teaching the rest of the group a new skill, activity, technique, etc. We also utilize free/inexpensive training opportunities locally as well as from subject matter experts within the department. To keep them motivated, we pick a couple of big projects to tackle over the course of the year and split into teams. Each team has a leader who is responsible for keeping everyone on course, tracking a budget, creating a timeline, and presenting updates to the rest of the group. I’m curious to hear what you have found works well (or doesn’t work) for you and your staff! It’s that time of year when thought must be given to hiring summer workers. Even if you aren’t, stick with me. While you are out trying to find that next superstar, give some thought to the following. This may be the beginning of the fulfillment of a lifelong dream. I know many of you understand this but it might be a good time to remember what it was like to be on the summer job hunt. Be patient. Be understanding. I remember being a knot-headed college student who thought he knew what he wanted out of life. The problem was I had so little in the way of life experiences that I really didn’t know what I wanted. One of the hardest parts of my job as a college professor is asking an eighteen-year-old college student what they believe their thirty-year-old self will want to do. Think about it. You have hopes and dreams as a college student and they may not be connected to reality. Sometimes dreams change as we move through life. I like to say that I want to change my title from ‘Professor’ to ‘Facilitator of Dreams.’ It brings me great joy to watch students progress through college and move on to the real world. This process is only a short part of their life span. With that said, it is a critical part. This is where you come in. Whether you are in a position to hire someone or not, all of us have an opportunity to touch the future. When you visit with young folks, really get to know them. Find out what they are interested in, what they like, what makes them tick. They probably have never heard of interpretation. You could be the one who connects the things they naturally like with a fulfilling career. This could be an incredible turning point. Those superstars are out there. We just need to find them. Applications are now available for scholarships to attend the Sunny Southeast’s Regional Workshop Feb. 2-5, 2015, in Humacao, Puerto Rico. The deadline for both scholarship applications and award nominations is December 21st, so act now! Scholarships are available to attend the workshop! Deadline: December 21st, 2014. All scholarship applicants will submit a short writing that can be posted to the Region’s blog or in our newsletter! All materials should be submitted electronically to Steve Dimse at steve@dimse.com. Who’s that interpreter you just know needs some extra recognition for their amazing work? Please consider nominating them for an award, which will be announced at the Regional Workshop in Puerto Rico! The award categories include Outstanding New Interpreter, Outstanding Interpreter, and Outstanding Service to NAI Region Three. Deadline: December 21st, 2014. Submit electronically to Steve Dimse at steve@dimse.com. 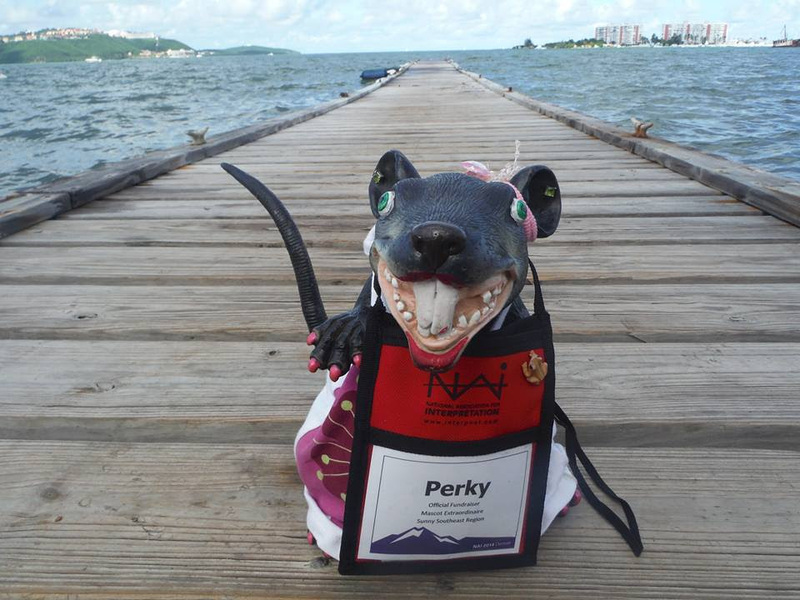 Don’t miss these opportunities to get your applications and nominations in by December 21st, and be sure to save the dates to join Perky in beautiful, sunny Puerto Rico February 2-5! Come join me in Puerto Rico! For you college football fans, you know this past weekend was the battle of many instate rivals. I went to a sports bar with a friend to cheer on our beloved dawgs. As in most sports bars, there are several different games on at the same time. As each team made a play, a cacophony of cheers would erupt when their team scored. You could identify which team they were cheering for by the calls they made. It reminded me of the variety of calls we hear in nature. 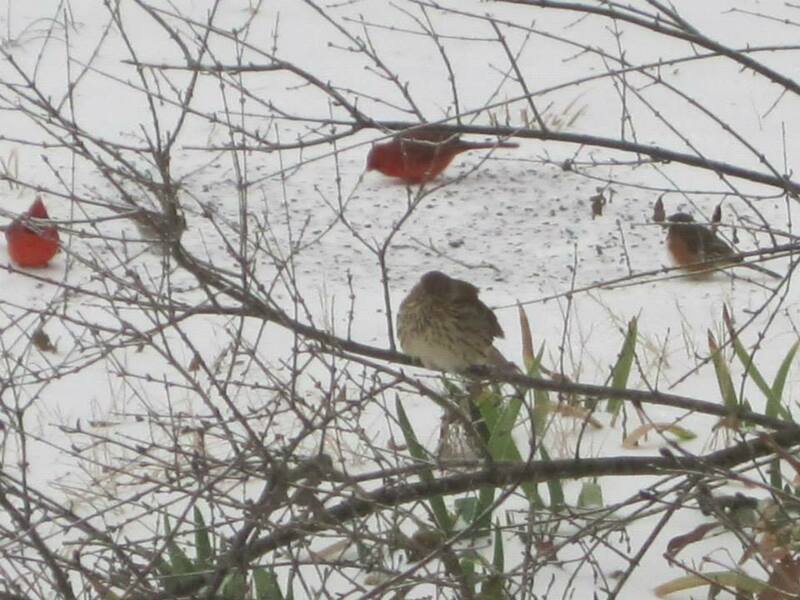 Birds from 2013 Backyard Bird Count. As a naturalist, when an animal makes a call, visitors question me “is it a bird? Frog? Bigfoot?” I try to find ways to help them make a connection to that sound so they will remember it the next time they hear it. I start with some of the easiest calls. As in football, some cheers are easy to recognize which team the fans are cheering for when they make their call. For example, if you hear “C-L-E-M-S-Oooooo-N!” you know they are Clemson fans. Some animals also say their names like the Eastern Phoebe and a spring peeper. When visitors have learned those, I teach them to listen to calls and write down something that will help them to remember that call. They may hear the “peter, peter, peter” of a Tufted Titmouse or a “baaaaaaah” of narrowmouth toad. This can be an important reference resource that can be used in addition to field guides or recordings of calls. When visitors to the nature center learn these calls, I can encourage them to take part in citizen science projects like Frogwatch, Christmas Bird Counts or eBird. This information can help scientists gather important data to monitor populations of species, range, introduction of invasive species, and phenology all by the calls they are hearing. Listening to the calls of the wild is a fun and interesting way to learn what lives around you and participate in important scientific research. These skills can be helpful identifying the natural wildlife or the crazy sports fan near you! Gooooo Dawgs! Woof Woof Woof! 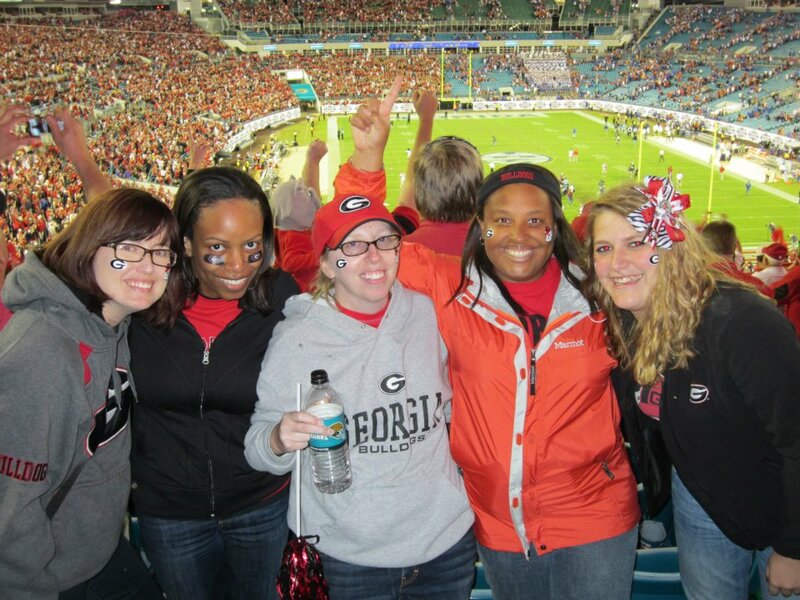 UGA fans cheering on the dawgs.